We begin this sweet candle with a layer of our amazing Lemon Zucchini Bread fragrance, we then add a second layer in the same scent. The final layer is the same amazing scent in a whipped topping. We complete this yummy candle by adding a wax dollop embed, lemon slice wax embeds and a touch of glitter. Just so darn cute, a perfect additon to your candle collection. Poured up in our favorite Love, Victoria jar with over 18 oz. of scrumptious wax these candles will give you hours and hours of enjoyment! 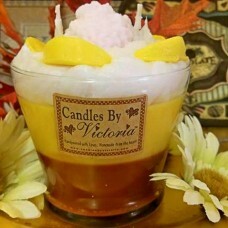 This candle measures 4 inches tall, it has a very wide opening of 4 inches and tapers down to 3 1/2 inches at the bottom. We love this container so much because of the wide mouth, it allows for a larger melt pool, which in turn produces an outstanding scent throw! These candles come double wicked for a perfect burning candle from beginning to end. Please place candle on heat safe plate while burning, possible over flow can happen during the initial burn.